Francis Lawrence's 2007 version of I Am Legend was a box office smash taking just shy of $600 million dollars worldwide, with Will Smith proving the Fresh Prince was the King of Hollywood for a reason. The film itself is good but suffers from a godawful third act collapse when the focus detracts from Big Will, resulting in the most formulaic of gung-ho endings plus the strangest dues ex machina explanation. Check out the alternative ending on the DVD for a much closer representation of Matheson's original text, by the way. 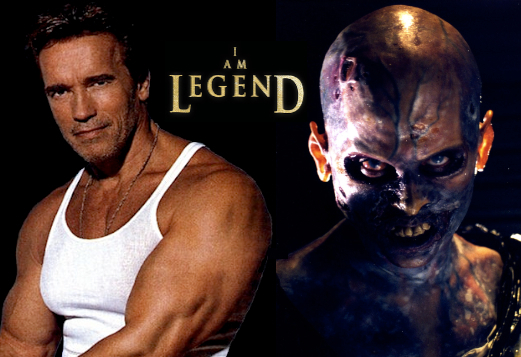 What if Ridley Scott had directed I Am Legend? Let us head back to the late 1990s. Science fiction cinema is booming. The Star Trek films are appearing almost annually. Stargate, Mars Attacks, Contact, Twelve Monkeys and Alien 3 all came out with middling to strong box office results. The market is primed for an I Am Legend star vehicle. Warner Bros. owned the rights to Richard Matheson's novel having purchased them for Charlton Heston's The Omega Man. Therefore, they were eager to get cracking with Mark Protosevich (screenplay author of Poseidon and story author of Thor) hired to deliver a spec script. He returned with a script of The Cell. This would later become a vehicle for J. Lo and Vince Vaughn in 2000 -- nobody wins out of this debacle folks. The script, which bore strong similarities with Matheson's novel, impressed with the story now set in San Francisco in the year 2000. Sir Ridley signed on in early 1997, working with the script by Protosevich, with Schwarzenegger set to star as the resourceful, lone survivor Robert Neville. By July 1997, production was slated for a September start date with locations lined up, and everything was going swimmingly but... this was not the case. Scott, never truly impressed by Protosevich's original script, hired John Logan. Logan, who would eventually follow Scott onto Gladiator, had spent months providing ideas and creating several drafts of a dystopian LA destroyed by the virus. As Wikipedia notes, "The Scott/Logan version of I Am Legend was a bold, artistic mash of sci-fi action and psychological thriller, without dialogue in the first hour and with a somber ending." They're actually right y'know. The script is delightfully dark and thoughtful. The dialogue is taut, and intense. I can't truly imagine Schwarzenegger getting his chops around some of it, yet I visualize this as a present day horror version of Blade Runner. The shocks are definitely there, and there is plenty of opportunity for Scott to deliver his wide, expansive awe-inspiring shots. Do check it out for yourself. Here's the link. The bold, almost silent, opening hour was just one of a series of problems Warner Bros. had with the project. The sombre ending, the overly negative story (what did they expect from a story that features depression, alcoholism and mass death?! ), and a lack of commercial/merchandising appeal lead WB to become much more forceful about how their money was being spent. One must remember that Logan had yet to have any of his work produced, and Scott had come off the back of three box office and critical disappointments (1492: Conquest of Paradise, White Squall and G.I. Jane) -- thus neither had the complete confidence of Hollywood. It was not until Gladiator that Sir Ridley re-asserted his directorial prowess and prestige. Discouraged by the psychological emphasis over action beats, Protosevich was brought back in against Scott's wishes. Entering December 1997, the problems were ever-increasing. The budget had now hit $108 million, with shareholders pressuring WB to intervene and stop the costs spiralling out of control. $108 million is no blockbuster figure but I'm sure a cursory glance at the books of 'bold' projects such as Ishtar, Cutthroat Island and Heaven's Gate will have had executive pulling at their collars. Add to this, Warner Bros own box office failures with sci-fi flicks such as Sphere and The Postman, both led by A-listers such as Samuel L Jackson, Dustin Hoffman and Kevin Costner. Plus, the fact that this film's lead - Schwarzenegger - had seen his last film, Warner Bros' very own Batman & Robin, fail spectacularly with the former Governor earning a Razzie nomination as Worst Supporting Actor. Scott desperately tried to save the project, rewriting the script to reduce the budget by $20 million. However, in March 1998, the studio pulled the plug. Recently, footage emerged of what Scott had in mind for his mutants. Rather than rely on CGI, Scott -- as seen with Prometheus -- favored the art of make-up, prosthetics and animatronics. It's some truly stunning work. Credit to Empire, Wikipedia and David Hughes' amazing book 'The Greatest Sci-Fi Movies Never Made', which provided inspiration for the feature. Buy it here.